Dead End in Norvelt is the winner of the 2012 Newbery Medal for the year's best contribution to children's literature and the Scott O'Dell Award for Historical Fiction! 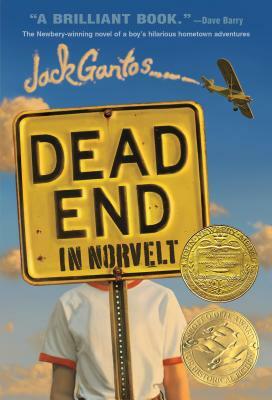 Melding the entirely true and the wildly fictional, Dead End in Norvelt is a novel about an incredible two months for a kid named Jack Gantos, whose plans for vacation excitement are shot down when he is "grounded for life" by his feuding parents, and whose nose spews bad blood at every little shock he gets. But plenty of excitement (and shocks) are coming Jack's way once his mom loans him out to help a feisty old neighbor with a most unusual chore—typewriting obituaries filled with stories about the people who founded his utopian town. As one obituary leads to another, Jack is launched on a strange adventure involving molten wax, Eleanor Roosevelt, twisted promises, a homemade airplane, Girl Scout cookies, a man on a trike, a dancing plague, voices from the past, Hells Angels . . . and possibly murder. Endlessly surprising, this sly, sharp-edged narrative is the author at his very best, making readers laugh out loud at the most unexpected things in a dead-funny depiction of growing up in a slightly off-kilter place where the past is present, the present is confusing, and the future is completely up in the air. Jack Gantos has written books for people of all ages, from picture books and middle-grade fiction to novels for young adults and adults. His works include Hole in My Life, a memoir that won the Michael L. Printz and Robert F. Sibert Honors, Joey Pigza Swallowed the Key, a National Book Award Finalist, and Joey Pigza Loses Control, a Newbery Honor book. Jack was born in Mount Pleasant, Pennsylvania, and when he was seven, his family moved to Barbados. He attended British schools, where there was much emphasis on reading and writing, and teachers made learning a lot of fun. When the family moved to south Florida, he found his new classmates uninterested in their studies, and his teachers spent most of their time disciplining students. Jack retreated to an abandoned bookmobile (three flat tires and empty of books) parked out behind the sandy ball field, and read for most of the day. The seeds for Jack’s writing career were planted in sixth grade, when he read his sister’s diary and decided he could write better than she could. He begged his mother for a diary and began to collect anecdotes he overheard at school, mostly from standing outside the teachers’ lounge and listening to their lunchtime conversations. Later, he incorporated many of these anecdotes into stories. While in college, he and an illustrator friend, Nicole Rubel, began working on picture books. After a series of well-deserved rejections, they published their first book, Rotten Ralph, in 1976. It was a success and the beginning of Jack’s career as a professional writer. Jack continued to write children’s books and began to teach courses in children’s book writing and children’s literature. He developed the master’s degree program in children’s book writing at Emerson College and the Vermont College M.F.A. program for children’s book writers. He now devotes his time to writing books and educational speaking. He lives with his family in Boston, Massachusetts.